The Consumer Financial Protection Bureau, the agency created at President Obama’s urging in the aftermath of the financial crisis, took its most aggressive step yet on behalf of consumers on Thursday, proposing regulations to rein in short-term payday loans that often have interest rates of 400 percent or more. “We are taking an important step toward ending the debt traps that are so pervasive in both the short-term and longer-term credit markets,” Richard Cordray, the director of the Consumer Financial Protection Bureau, said in a statement on Thursday. The borrowing patterns speak to a stark reality underpinning the roughly $46 billion payday loan industry: The working poor in America, a group with virtually no savings and little access to traditional bank loans, borrow to cover basic expenses. In drafting the rules, according to interviews with people briefed on the matter, the Consumer Financial Protection Bureau, and its director, Mr. Cordray, wrestled with how to protect some of the most vulnerable consumers, without choking off credit entirely. Driving the proposal was an analysis of 15 million payday loans by the consumer bureau that found that few people who have tapped short-term loans can repay them. Borrowers took out a median of 10 loans during a 12-month span, the bureau said. More than 80 percent of loans were rolled over or renewed within a two-week period. Nearly 70 percent of borrowers use the loans, tied to their next paycheck, to pay for basic expenses, not one-time emergencies — as some within the payday lending industry have claimed. Until now, payday lending has largely been regulated by the states. The Consumer Financial Protection Bureau’s foray into the regulation has incited concerns among consumer advocates and some state regulators who fear that payday lenders will seize on the federal rules to water down tougher state restrictions. Fifteen states including New York, where the loans are capped at 16 percent, effectively ban the loans. The current economic model of low minimum wages and high payday loan fees drives people into poverty, triggering welfare payments. The U.S. government is basically transferring welfare funds to the payday loan industry. Proposed CFPB regulations don’t go far enough, a maximum cap on loan repayments is needed. There is room for generous profit margins to compensate for the risk of lending to low income individuals without creating a “debt-trap”. The stress and time dedicated to satisfying debt collectors amplifies the cost of being poor. Surely it would be more effective to provide access to credit, instead of wringing societies least financially secure through the payday loan system. Perhaps more money would be spent on its intended purposes, instead of paying off predatory loans. Part of the solution could be using Post Offices as low cost banks for the poor. Sure there would be costs associated with effectively providing financial services, but the physical infrastructure and a trustworthy brand already exist. Furthermore, such a plan would provide renewed social value to an American Institution constantly under budgetary scrutiny. Postal Banks would inject competition into the credit market, leading to better services at more competitive rates. Even if Post Office banks operated at a loss (say, giving preferential rates to low income borrowers for certain purposes), this loss may be more than offset by reduced spending on entitlement programs. More research on the cross-section between welfare recipients and payday loan borrowers is needed. It is not a question of which of these poverty traps exists–they all exist and for some people are mutually reinforcing. This is one of the reasons social mobility is such a difficult issue to address. Countering these different reinforcing poverty traps require the right mix of regulation, fiscal policy (progressive taxation, adequate spending on welfare programs and public services), and livable minimum wages. In the end, lower income Americans need to overcome negative perceptions of government and vote in large numbers. Again the time crunch associated with poverty rears its ugly head; voting isn’t just a decision to go to the polls, it is also a time commitment that many cannot afford. Categories: Blog Posts, Economic Outlook | Tags: CFPB, debt trap, living wage, Minimum wage, payday loan, poverty, Poverty trap, predatory lending | Permalink. Developing countries that invested in quality jobs from the early 2000s grew nearly one percentage point faster every year since 2007 and were better able to weather the economic crisis than comparable economies, according to a new report by the United Nations labour agency. The annual report of the International Labour Organization (ILO), The World of Work 2014, focuses this year on the relationship between good jobs and national development through analysis of 140 developing and emerging nations. “Decent work opportunities for women and men help trigger development and reduce poverty,” Guy Ryder, Director-General of the ILO,” said in a news release on the launch of the report, subtitled Developing with Jobs. “Social protection, respect for core labour standards and policies that promote formal employment are also crucial for creating quality jobs that raise living standards, increase domestic consumption and drive overall growth,” he added. “In view of the evidence, it is essential to make decent work a central goal in the post-2015 development agenda,” stressed Raymond Torres, Director of the ILO Research Department. Quality jobs are an important tool for escaping poverty traps. In a recent post, I said that economics is always context sensitive; this does not mean, however, that certain things–such as quality jobs–are not important in all contexts. Whether in a rich or poor country, societies poorest are unable to escape poverty traps because they do not save–they either spend their entire income on survival or short-term luxuries to distract them from life’s problems. While “extreme poverty” (living on less than $1.25 /day, adjusted for purchasing power parity) is confined to the world’s least developed countries (LDCs), relative poverty exists everywhere. 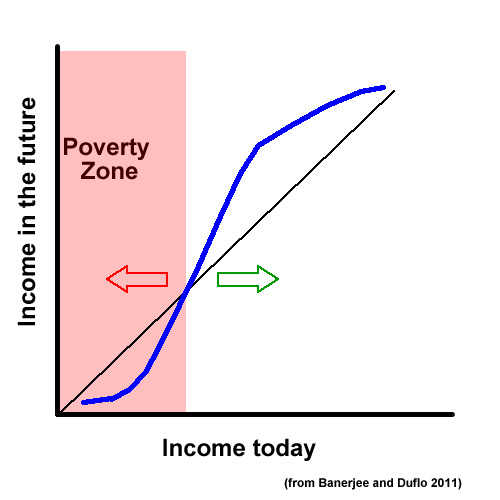 While the exact income level needed to escape a poverty trap (the inflection point on the graph above) is context sensitive, the general relationship holds in all contexts. Underpinning the universality of relative poverty is the inverse relationship between marginal propensity to consume (MPC) and income; the lower ones income, the greater percentage of it they will consume. The flip side of this is low savings–the higher one’s MPC (ranging from 0-1), the lower one’s MPS (MPS + MPC = 1). This inability to save perpetuates a vicious cycle of low productivity, low wages, and low savings resulting in inadequate investment in “human capital” (education, healthcare, etc), which is what causes the low level of productivity in the first place–a poverty trap. While different income groups in different countries have different levels of MPC/S, this general relationship between income, consumption, savings, investment and poverty holds in all contexts. Invest in human capital, particularly needs-based investment (which, due to low levels of income / savings, these people cannot afford themselves) to boost worker productivity, physical capital (infrastructure projects), and growth markets (such as renewable energy) to boost economic output and create jobs in a depressed economy (counter-cyclical fiscal policy). Raise the minimum wage and support collective bargaining (unionization) to increase take home pay for “blue collar” workers. Cut spending to reign in the deficit, restoring confidence in the economy so “job creators” (those who hold financial capital) will reinvest into the economy. 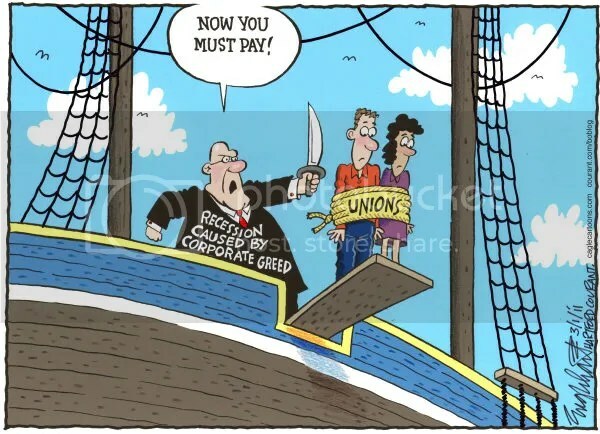 Perpetuate a “race to the bottom” by discouraging collective bargaining and subsidizing private job creation by providing tax breaks / subsidies to private companies . Reduce taxes and regulations as much as possible (starve the “beast”). Rely on private actors, market forces, and trickle-down economics to result in the optimal allocation of resources. Conservatives will point to a low unemployment rate (currently 6.3%) to prove that additional stimulus spending is not needed. Liberals will counter with evidence of wage stagnation and “working poor” to argue that greater labor market intervention is needed. The question then becomes, what is a quality job? Is it simply having a job, or is a minimum salary (perhaps that inflection point) needed? Further clouding the issue is the apparent disconnect between productivity and wages, implying that simply training low wage workers–the typical remedy for escaping “poverty traps”–may be insufficient to create “quality jobs” (and hence the growing minimum wage movement). History has resoundingly and repeatedly debunked the concept of “trickle down economics” yet it keeps coming up in mainstream political economy discussions–something Paul Krugman would call a “Zombie Idea”. The reason this “zombie idea” persists is relatively straightforward–vested interests with large levels of wealth perpetuate this view through the mainstream media. They state any additional costs (taxes, regulations, wage increases) will cause massive job loss despite record high corporate profits (after taxes) and stock values , and (relatedly) historically low corporate income tax rates. I leave my readers with this question; which plan to create quality jobs sounds more likely to work to you? Take that answer to the voting booth with you during the 2014 midterm elections, because quality jobs are the key to sustainable human development, economic growth, and social cohesion. Categories: Blog Posts, Economic Outlook | Tags: conservative, Democrat, jobs, jobs report, liberal, Minimum wage, quality jobs, Republican, UN, unemployment, wages | Permalink. The following blog combines two previous topics discussed here at NN–Public-Private Partnerships (PPPs) and State subsidies to private corporations. While both technically represent a “pubic-private partnerships” (both public and private money going towards the same goal), that is where the similarities end. Public-private partnerships, as they are intended, leverage public (tax-payer) money to raise private sector money for a cause. These partnerships often raise money for innovative purposes, in order to help cultivate new industries which indirectly lead to future jobs and tax-revenue. Universities, as centers of R & D and learning / training, also have a role to play in PPPs teaching people the skills needed to take part in this innovation. An example of a PPP that functions this way are President Obama’s recently announced manufacturing institutes. With less than two weeks till his State of the Union address on Jan. 28, Mr. Obama hastened to make good on a pledge from last year’s speech, announcing the creation of a high-tech manufacturing institute aimed at creating well-paying jobs. Speaking to 2,000 students at North Carolina State University, which is leading a group of universities and companies that established the institute, Mr. Obama said it was the kind of innovation that would reinvigorate the nation’s manufacturing economy. This is the first of three such institutes the White House plans to announce in the coming weeks. It will be financed by a five-year, $70 million grant from the Department of Energy, which will be matched by funding from the consortium members, including the equipment maker John Deere and Delphi, an auto-parts maker. The institute will use advanced semiconductor technology to develop a new generation of energy-efficient devices for automobiles, consumer electronics and industrial motors. Earlier Wednesday, Mr. Obama toured a Finnish company, Vacon, that makes drives used to control the speed of electric motors, to increase their energy efficiency. Confessing that there was “a lot of physics” in the company’s presentation, the president seemed most interested in which of the components were made in the United States. But it also laid bare the limits of Mr. Obama’s authority, since Congress has stymied his more ambitious proposals that require legislation. In last year’s State of the Union address, the president announced a $1 billion plan, modeled on one in Germany, to create a network of 15 institutes that would develop new industries. But setting up 15 institutes would require congressional authorization. So last year, Mr. Obama narrowed his focus to establishing three institutes using existing funds and executive authority. At the same time, he increased his long-term goal to 45 institutes over 10 years, while acknowledging this would require congressional action. To be clear, PPPs are not a call for charity–they represent mutually beneficial and sustainable economic arrangements. Businesses need future employees and customers, governments need non-dependent tax payers, a Universities future success is linked to it’s graduate employment rate, and people need jobs. If these projects prove successful, it will be difficult for congress to block the programs expansion. Boeing is a company that pits state governments against one another to compete for larger subsidies and forces communities into a race to the bottom to see who can fight unions and lower wages the fastest. It is a prime example of 21st century business in the United States. As a result of these tactics, American workers, both unionized and independent, have little choice but to accept the lowered living standards their employers offer as conditions for their doing business. This practice has become common. In the last year alone, 13 states granted corporate subsidy packages of over $100 million to companies like Toyota, Yokohama Rubber, Boeing and MetLife. Many of these subsidies are not for job creation but for job relocation — to lure business over to one state at the expense of its friends and neighbors. The story of Boeing is an example of how ruthlessly U.S. businesses use the needs of some workers to justify lowering the standards of others, to the ultimate detriment of both. Boeing’s strategy is a profitable one. It saves the company money, reduces wages and benefits for workers and ultimately absolves the company of any financial responsibility to take care of its retirees. As a result, production workers, regardless of their state, are left with a smaller slice of a bigger pie. This is, of course, the point: “Now that we have internal competition (among production sites), we’re going to get much better deals,” Boeing CEO Jim McNerney explained in May. The deals aren’t only on the price of labor, but on the size of subsidies, which states and municipalities must fit into their budgets by either raising taxes or cutting services. These initiatives, unlike PPPs which are aimed at innovation and job creation, only benefit a single corporation. Furthermore, these projects often amount to job relocation, as opposed to job creation. There are many good reasons for subsidies to exist; for example, subsidies can help promote “infant industries” and to reward positive externalities. However, giving tax-payer money to already profitable companies in order to lure jobs from one municipality to another is not one of them. Private sector job creation is not charity, it is a cost of doing business that companies would face regardless of a subsidy. The problem is this country has empowered corporations at the expense of workers and societies as a whole. Don’t believe me? There is ample evidence of the different “recoveries” experienced by the “haves” and the “have nots” in America (spoiler: the wealthiest have done great post-recession, while masses have seen declining wages and standards of living). There are no easy fixes to this reality; only by championing workers rights, increasing minimum wages, and ending the municipal “race-to-the-bottom” (perhaps by creating a federal oversight board with the exclusive power to negotiate private-sector subsidies, based on needs-based C-B analyses) can we hope to take America back for the average working man / woman. PPPs can play a positive role in this transition, if they are used to spur new investment and industry. On the other hand, taking money out of public programs and giving it to private corporations will only exacerbate the divergence between the “haves” and the “have-nots”. It is true that we face a depressed labor market; in such an environment, people are afraid to speak up in fear of losing whatever job they do have. On a larger scale, politicians are unwilling to take any stand that may be met with retaliation by corporate interests. This fear is being used against the American public by corporations to further push down their costs even as they realize record profits. If we can overcome this fear, and challenge the bellicose rhetoric of private sector interests, we can begin to realize a redistribution of wealth which would benefit not only individuals but our economy as a whole. It is up to Americans to decide what role we want the private sector to play in our economy, and elect leaders who will fight for those goals. Will we support corporations that share in the costs of sustainable human development, or will we continue to reward corporations that value short-term profits above all else? Categories: Blog Posts, Economic Outlook | Tags: inequality, Minimum wage, PPP, public-private partnership, subsidy, tax revenue, union | Permalink. There has been a strong push this holiday season (really dating much farther back) by a variety of labor groups seeking higher minimum wages. Specifically, Walmart employees, Fast-Food Workers, and most recently low-level financial sector employees have taken to the streets to make their demands for “livable wages” heard. As one who believes in the positive externalities of a more egalitarian society, as well as a proponent of collective action, I am happy to see people using the tools at their disposal to overcome power-asymmetries that have persisted for decades. It would appear that I am not alone in this sentiment–according to Gallup polling, 76% of Americans support raising the minimum wage to $9/hr (69% support raising the minimum wage to $9/hr and indexing the minimum wage to cost of living increases). Support for increasing the minimum wage stretches across the political spectrum. As Larry M. Bartels, a political scientist at Vanderbilt, shows in his book “Unequal Democracy,” support in surveys for increasing the minimum wage averaged between 60 and 70 percent between 1965 and 1975. As the minimum wage eroded relative to other wages and the cost of living, and inequality soared, Mr. Bartels found that the level of support rose to about 80 percent. He also demonstrates that reminding the respondents about possible negative consequences like job losses or price increases does not substantially diminish their support. It is therefore not a surprise that when they have been given a choice, voters in red and blue states alike have consistently supported, by wide margins, initiatives to raise the minimum wage. In 2004, 71 percent of Florida voters opted to raise and inflation-index the minimum wage, which today stands at $7.79 per hour. That same year, 68 percent of Nevadans voted to raise and index their minimum wage, which is now $8.25 for employees without health benefits. Since 1998, 10 states have put minimum wage increases on the ballot; voters have approved them every time. 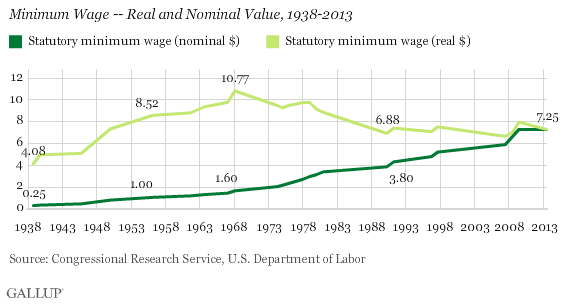 But the popularity of minimum wages has not translated into legislative success on the federal level. Interest group pressure — especially from the restaurant lobby — has been one factor. The social benefits of minimum wages from reduced inequality have to be weighed against possible costs. When it comes to minimum wages, the primary concern is about jobs. 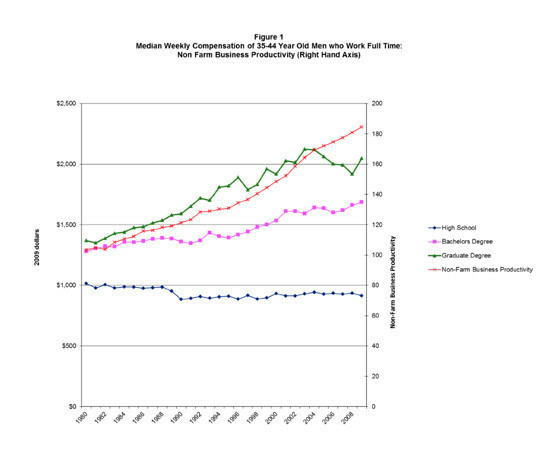 The worry comes from basic supply and demand: When labor is made more costly, employers will hire less of it. It’s a valid concern, but what does the evidence show? Still, even if international competition isn’t an issue, can we really help workers simply by legislating a higher wage? Doesn’t that violate the law of supply and demand? Won’t the market gods smite us with their invisible hand? The answer is that we have a lot of evidence on what happens when you raise the minimum wage. 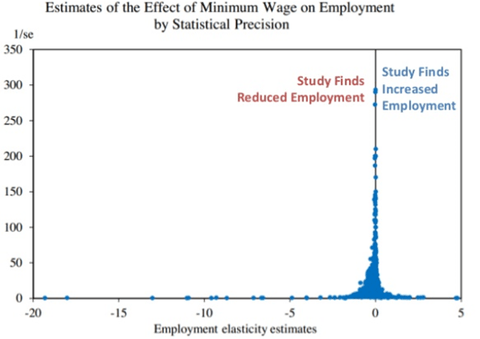 And the evidence is overwhelmingly positive: hiking the minimum wage has little or no adverse effect on employment, while significantly increasing workers’ earnings. It’s important to understand how good this evidence is. Normally, economic analysis is handicapped by the absence of controlled experiments. For example, we can look at what happened to the U.S. economy after the Obama stimulus went into effect, but we can’t observe an alternative universe in which there was no stimulus, and compare the results. When it comes to the minimum wage, however, we have a number of cases in which a state raised its own minimum wage while a neighboring state did not. If there were anything to the notion that minimum wage increases have big negative effects on employment, that result should show up in state-to-state comparisons. It doesn’t. So a minimum-wage increase would help low-paid workers, with few adverse side effects. The majority of small business owners responded they would not reduce their current workforce (64%) or reduce worker benefits (60%) if the minimum wage was increased. The largest negative effect would be a reduction in capital spending (38%). However, in the context of a divergence of worker compensation from productivity, and a declining share of income going to labor (in favor of capital), perhaps such a re-balancing is not such a bad thing. Small business owners are not thrilled about the prospect of a minimum wage increase–they are not expected to be. 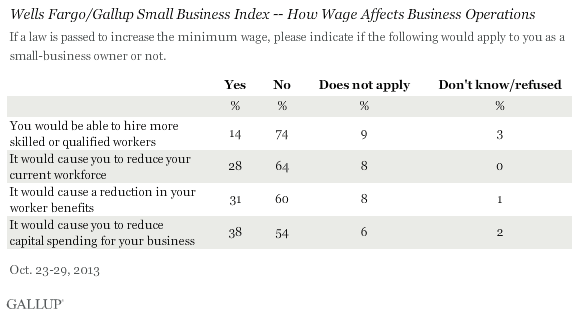 However, the fact that nearly half support raising the minimum wage says something about small business owners. Perhaps they recognize peoples purchasing power is tied to their wages, so increasing wages will eventually lead to higher sales (especially considering minimum wage employees have a much higher marginal propensity to consume than wealthier people). Or perhaps these people are simply more in touch with what happens in the communities they live in than their big-business contemporaries. They know people living on the minimum wage aren’t lazy people waiting for a government handout; they are their friends, family, and customers. Perhaps they believe that more egalitarian communities are friendlier, safer places, and are willing to pay a little extra in order to achieve that goal. Increasing the minimum wage is overwhelmingly popular, and more popular among small business owners than one would expect. Furthermore, it would save billions of dollars in Welfare programs by ending an implicit subsidy for businesses who pay non-livable wages and stimulate the economy by redistributing income to people who are more likely to spend it. The time to act has come; people are literally taking to the streets. It is also important to index the minimum wage to cost of living increases, so we do not experience the declining real minimum wage we have had for the past 4 decades. Indexing also avoids a political battle every-time the cost of living changes (which it constantly does). I for one am interested and excited to see the myriad benefits that decreasing poverty rates and reversing the trend of increasing income inequality have on American society as a whole. Categories: Blog Posts, Economic Outlook | Tags: cost of living, EITC, fast food industry, gallup, index, inequality, krugman, livable wage, Minimum wage, poverty, small business, strike, subsidy, union, wages, Walmart, welfare | Permalink.